Coleraine laid their Ballinamallard hoo-doo to rest on Friday night as they came from behind to win 2-1. 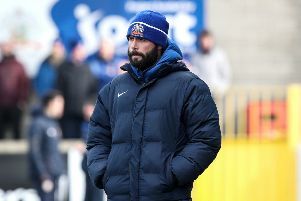 Substitute James McLaughlin levelled things up with 20 minutes to go and teenager Jamie McGonigle struck in stoppage time to give the Bannsiders their first win in 13 attempts against the Mallards. The visitors spurned a glorious opportunity to break the deadlock with 10 minutes gone. Jason McCartney’s inswinging free kick was flicked on by Adam Leckey, but Emmet Friars headed over from a yard out. Brad Lyons almost made the Mallards pay seven minutes later as he surged forward only to see his shot whistle past the upright. Some neat play from Michael McCrudden on 24 minutes saw Liam Martin race clear, his powerful shot was well blocked by the legs of Michael Doherty. The Bannsiders keeper could do nothing four minutes later as Ballinamallard hit the hosts on the break. McCartney showed good pace to get to the byline before cutting the ball back for the front man, whose deflected effort wrong footed Doherty and found the net. Doherty did well to deflect Ryan Campbell’s close range effort away from the goal as half time loomed large. Ballinamallard suffered a blow three minutes into the second half as James McKenna was shown a straight red card for a late challenge on Ruairi Harkin. The Bannsiders had a let off on 54 minutes as Michael McCrudden weaved his way past several defenders, but his shot was superbly tipped over by Doherty. The game was turning into attack versus defence as Coleraine dominated possession with the Mallards content to hold what they have. The pressure finally paid off for the Bannsiders with 20 minutes to go as James McLaughlin equalised. Brad Lyons whipepd a great ball into the box and the substitute fired home at the back post. Oran Kearney’s men were well on top but they were struggling to really test Alvin Rouse, McLaughlin and Falconer going closest as the game headed into the closing stages. As the game entered stoppage time Coleraine struck and what a composed finish it was from McGonigle. He picked up the loose ball before cutting inside and firing low past Rouse to seal the comeback for the home side. Coleraine: Doherty, Mullan, Falconer, Douglas, Canning, Parkhill (McLaughlin 60), Beverland, Harkin, Brown, Lyons, McGonigle. Subs: Watt, Law, Lindsay, Findlay. Ballinmallard United: Rouse, McMenamin, McLaughlin, Carters, Friars, McCartney, McKenna, Leckey, McCrudden (Hume 72), Campbell (Lafferty 51), Martin.